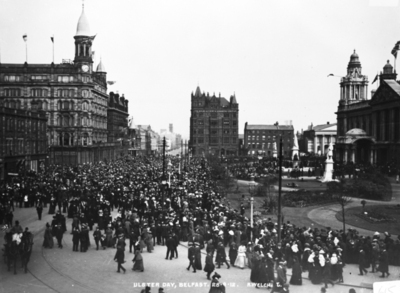 In 1911, Belfast was a city dominated by Protestant capital and Protestant commerce. Belfast did not have the high-society culture which centred on Dublin Castle; there were not enough aristocrats living in the city to replicate the lavish balls and banquets of other cities of empire. There was pomp and symbolism, of course. 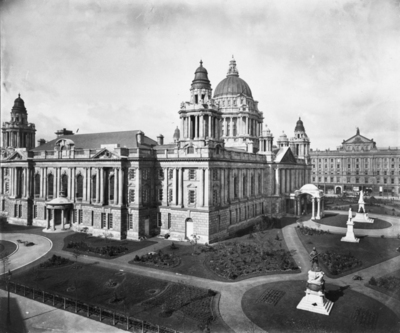 When Belfast City Hall was officially opened in 1906, it epitomised the prosperity and self-confidence of a city on the rise. Catholics constituted around one-quarter of the population of Belfast, but their role in the hierarchy of the city was a subordinate one. Protestant control of Belfast was, in part, represented by the Orange Order. There were lodges in various parts of the the city. Ballynafeigh Orange Hall, for example, was opened in 1887 by Colonel Saunderson, MP, and was built as a result of the efforts of Robert Owen, a gasworks employee who did much to promote the Orange Order in South Belfast. This and other Orange Halls dotted around the city were a focal point for a whole range of community activities, as well as for parades. Catholic advancement was impaired by unionist fears that Belfast’s prosperity would be undercut by the rise of Irish nationalism. Nonetheless, the early years of the century had indeed brought some advancement for nationalists in Belfast. Councillors were elected, and Joseph Devlin became a central figure in the political life of Belfast, securing election to the House of Commons in London. People on both sides of the divide sought to dissolve the union of politics and religion, but they did not succeed. The gathering storm around the possibility of Home Rule for Ireland destroyed the prospect of building a common political platform unshaped by religion. Sectarian animosity was real and visible. In 1909, for example, parades on 12th July were accompanied by three days of rioting in nationalist areas. In 1912, with the furore over Home Rule reaching a crescendo, 2,000 Catholic workers were driven out of the shipyards and hundreds of Catholics were driven from the city altogether. © Ulster Museum 2008 W10-21-125: Unionist crowds queue to sign the Solemn League and Covenant outside City Hall on Ulster Day, 28 September 1912. 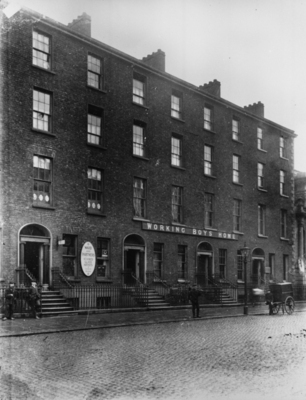 Religion was important to the life of the city ( see curate at Belfast Cathedral in this boarding house). The places of worship built by various denominations were impressive in scale and imposing in style. As the city expanded, so did the number of churches. University Road Methodist Church opened in the 1860s. There was a Presbyterian Church on University Road and another on Great Victoria Street. Elsewhere, there was St. Thomas’s Church on the Lisburn Road and St. Mary Magdalene Church Hall on Donegall Pass , as well as a Magdalene Home. St. Brigid’s Catholic Church on Derryvolgie Avenue was built in the 1890s. There was also a new convent dedicated to the Good Shepherd Sisters completed in 1911 on grounds which they already used on the Ormeau Road. To acknowledge the profile of religion in Belfast in 1911 is not to say that Belfast was a uniformly pious city (see Arthur Jaffe refusing information about his religion). 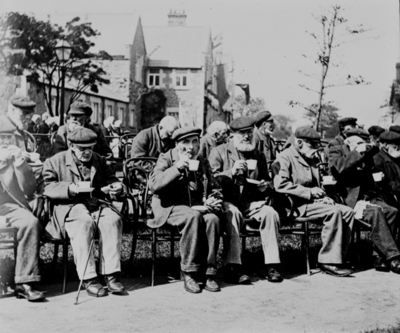 In the working-class Ballymacarett area, church attendance was estimated to be as low as one in fifteen. Religion mattered, but not always because of belief in God. It should also be noted that the divide in religion was not simply one between Catholic and Protestant. There was, for example, a synagogue on Great Victoria Street, along with a minister’s house and a Hebrew school. A prominent Jewish citizen of Belfast was Otto Jaffe, of Jaffe Bros. linen manufacturers who served as lord mayor of the city in 1899 and 1904. As well as churches and church halls, there were schools, hospitals, asylums and much else. St. Malachy’s Girls’ School on Sussex Place, as well as the adjoining convent , was paid for by the proprietor of the Royal Hotel, Matthew Bowen, and had opened in the 1870s. 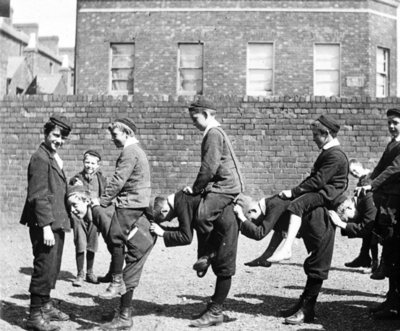 © Ulster Museum 2008 Y8519: Boys playing a posed version of churchie, a robust verison of leapfrog, in the playground of McQuiston National School, Belfast in 1902. Schools were invariably divided by denomination. 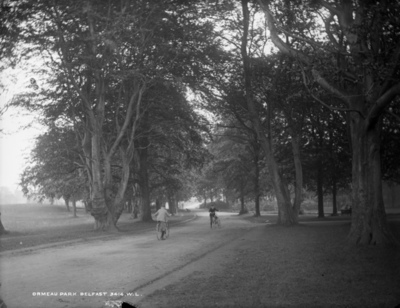 There was the Belfast Royal Academy on Cliftonville Road, the Antrim Road Baptist School, St. Malachy’s Christian Brothers’ School on Oxford Street which catered for primary and secondary education, the Malone Primary Schoolon Balmoral Avenue which was built by the Malone Presbyterian Church, and the Methodist College on the Malone Road. Sundry other educational establishments included the Ulster Institute for the Deaf, which was based at Fisherwick Place and was run by its first superintendent, Rev. Francis Maginn, who lived at 75 Lisburn Road. 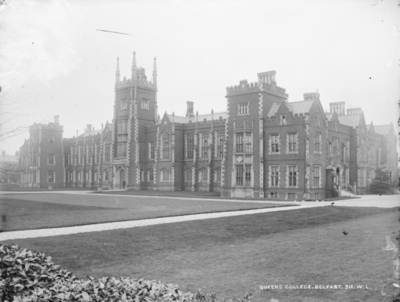 Maginn had lost his own hearing at the age of five when he contracted scarlet fever, and he spent a lifetime as a missionary for the deaf, not least through finding them work around Belfast. The single university in the city was Queen’s University. Among its star academics was Sir William Whitla, a graduate of the college and the professor of Materia Medica from 1890-1919. He was also president of the British Medical Association and physician to King George V.
Working conditions in the city were poor. Many of the processes involved in the textile industry severely damaged the health of workers, who often suffered from chronic lung diseases. As well as being vulnerable to bronchitis and similar conditions, many workers developed phthisis, a form of tuberculosis. Hospitals in the city included the Mater Infirmorum Hospital on the Crumlin Road and the Military Hospital at Queen’s University. There was also a hospital in the workhouse complex on the Lisburn Road (see returns for mentally ill patients). Just as in Dublin, there were asylums for ‘fallen women’. And, again just as in Dublin, these were organised on a denominational basis. At the heart of these institutions were laundries where women worked long hours. Amongst the various institutions were the Church of Ireland-run Ulster Magdalene Asylum on Donegall Pass, while parallel institutions were run by Catholics on Ormeau Road and Presbyterians on Whitehall Parade. 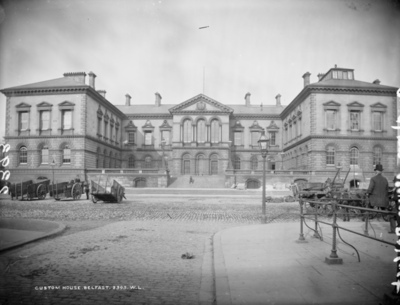 NLI LROY 2393: Custom House, Belfast, ca. 1910. Other institutions were run by the state and the city. 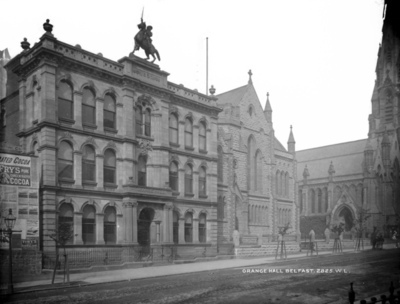 Great stone buildings such as the Harbour Office, the Ulster Hall, which housed a major exhibition of electrical and other technologically advanced goods in 1911, and the Custom House on Merchant’s Quay were landmarks. So were the various prisons, and police and army barracks. Non-political crime in Belfast was generally related to petty theft rather than to violence. Drunkenness, housebreaking and pickpocketing were the most common crimes in the city. Prisons and industrial schools across the city were home to offenders of various kinds. The Ulster Female Penitentiary was at the corner of Brunswick Street and Franklin Street, while there was also a necklace of reformatories across the city, both for boys and for girls. For all the focus on political violence, Belfast, like every other city in the world, was a place where human vices also had a stage.